After roaming in Tamil Nadu through short stories, it was a huge leap that I had to take to reach Maharashtra. The state that felt had only Mumbai written all over, now through this book, it is evident that life in Maharastra is more than what Mumbaikars have to say. Jejuri, a small dot in the map, 200 km away from the bigger dot, alienates the so called financial capital. Arun Kolatkar’s book has beautifully presented the case. You can say that ‘dynamite often comes in small packages’ be the perfect metaphor for this book. 31 poems artistically circumferences the entire city. The city is a pilgrimage destination and is known for the famous temple of Lord Khandoba. Khandoba, a form of Shiva, is believed be the protector for all and the patron deity for farming, herding, warriors and even some Brahmin castes. The book is an account of a person who arrives at Jejuri for the day in a state transport bus and ends the day, waiting for the train as the setting sun casts a picture that can leave anyone stunned. The book beautifully showcase the deep, inner essence of the feeling the person must have gone through during the journey. This journey of Kolatkar’s got him the Commonwealth Poetry Prize in 1977. After the journey in the bus, Kolatkar walks around Jejuri, starting at the temple he got off at. You can vividly pictures the scene, walking beside him throughout this iconic journey. Trust me, the image in mind will be clear. The language of the poem is unassuming and that gives a surreal portrayal of the emotion as you read through the lines. 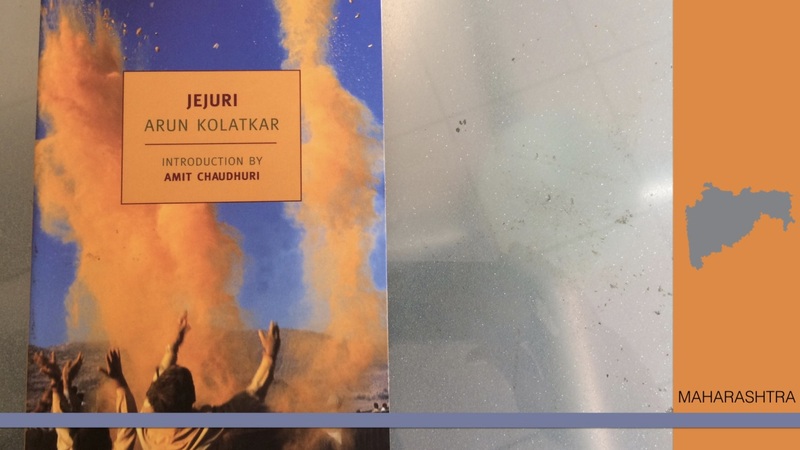 The “one-thing” that is unfathomable is the casual comparisons Kolatkar makes with the real world. just beyond the caste mark between his eyebrows. “How can one human being compare that to this?” is the question I kept getting as and when the pages turned to my next surprise. It’s a pillar on its side. Kolatkar’s way of describing the doorstep to the temple is an example of how the entire book is. The poems are intelligently structured in a manner that does not fantasise the fictional world of Jejuri. In fact, there are hard hitting realities of the state of the temple and the city, including its people. May be she likes a temple this way. Kolatkar was accompanied by novelist Manohar Oak to Jejuri. Both of them have had surprises of their own while walking through the city. Moving on from Kolatkar’s depiction and his companion’s, the author starts wondering what the other living beings would think of Jejuri. How different would the thoughts of rock be that from a dog or say a butterfly? This is what the book is all about. The simple, yet deep in emotion and wide in meaning lines about Jejuri, gives a full feast buffet. Culture, tradition, land has been altered through the course of history by mankind. It is these kinds of books that make sure, the soul continues to live through storm and drought. The journey ends with the author waiting for a train in the railway station, wondering, imagining as he watches the sun set, only to raise again. The book did give a MAK Tip. Jejuri has been on the map for such a long. But what makes these 31 poems across 53 pages so precious is Kolatkar’s observation skill. This is a skill one must have the ability to practice, experience and use everyday. There is a difference between, Look at the room, See the room and Watch the room. What ever you do, observe whats happening around you to become aware of the surrounding. Becoming aware makes you completely present in the moment. This in turn is deep work fuelled by mindfulness. Mindfulness is meditation. Meditation is going to a trans and that is spirituality. So spirituality is living.